No category	. Last reply by 59burst. 1 0 Want to undo ? my jenen P12R came back from the re-cone job at my local speaker repair shop. this new cone I got off ebay doesn’t look like the original as I expected. but it still sounds very close to my silver P12R speaker came from the friend who gave me this P12R. this tweed deluxe 5D3 came from December 1954. and the speaker came from a ’54 5C3. the date code one the speaker is 1953. they are like a family. it’s not easy to pick only one speaker for my tweed deluxe so far. P12n is a great sounding speaker with it’s chime and volume. but I want a jensen which is crispy at the lower volume. maybe the bell cover doesn’t affect the sound. but me and the friends tested two different jensen p12r came from the same era. and the result was different at low volume in 5C3. and most of all, p12r looks way better with the bell. it sounds really good with it’s look. even I like that red safety sticker on the bell. No category	. Last reply by 59burst. 6 1 Want to undo ? 50년대 트위드딜럭스는 P12R을 달고 나왔습니다. 수급 문제로 일부는 P12Q를 달고 나온걸로 알고 있습니다. P12R과 트위드딜럭스는 12와트로 같은 출력입니다. 펜더 트위드 앰프는 클린한 영역을 넓게 만들었습니다. 브레이크업 포인트가 스피커에 따라 달라지구요. P12R이 달린 오리지날 트위드딜럭스 샘플은 youtube에도 제법 많습니다. 저도 나중에 샘플을 올려보겠습니다. 악기 사용기에 샘플이 없으면 영 이상하고, 제가 친 소리도 영 이상해서 노력이 필요하네요. 이 5D3를 제가 원하는 수준으로 살리면서 사용한 스피커가 여럿입니다. 간단하게 성향을 써보겠습니다. 웨버 12A125A – 어떤 날은 천상 오리지날 Jensen 같고, 어떨 때는 새것 소리가 느껴지고 그랬습니다. 저나 친구들이나 개관적으로 점수를 주자면 Jensen 리이슈보다 월등히 높습니다. 빈티지 P12R보다 더 좋아하는 친구도 있습니다. Jensen P12R 61년산 – 벨이 있고 없고 차이가 있지만 늘 좋습니다. P12Q나 P12N하고 비교하면 더 크런치합니다. 같은 출력의 타이트한 맛이 좋습니다. Jensen P12N 61년산 – 브레이크업이 시작되는 시점이 늦습니다. 그 경계가 펜더 트위드 앰프 매력인데, 볼륨을 늘 높일 수 있는 공간에서는 P12N 하나면 충분할 것 같습니다. 음량도 크고 특유의 종소리, 혹은 좋은 실로폰이나 역시 좋은 나무실로폰 소리가 납니다. P12Q는 14와트로 여전히 타이트합니다. P12R과 비교하면 음량이 약간 더 크고, 브레이크업 시점은 거의 비슷하구요. 복스나 먀살같은 영국 앰프들은 이미 회로에서 게인이 걸리는데 펜더는 스피커와의 매칭이 브레이크업 시점과 질감에서 더 중요한 요소같습니다. 장식용이 되어버린 PRS 하나하고, 예쁘고 좋지만 쓰기에는 컸던 Vox 캐비넷을 처분할 때, 막연한 기대와 결심을 하나 했습니다. 기타, 앰프 그냥 하나씩만 두고 틈 나는대로 가지고 놀아보자구요. 트위드 챔프는 비교할 대상이 없었습니다. 집에서 쓸 수 있고, 가지고 다니기 좋고, 진공관이나 소자도 가진게 있으니 문제 생기면 고치면 되니 걱정 없고. 처음 데려와서 한 세달은 내리 가지고 놀았습니다. 중간중간 레코딩하던 친구가 쓰구요. 좋은 앰프, 진공관, 캐비넷, 스피커 이런 조합이 꽤 오랫만이었습니다. 예전에는 18와트 복각앰프가 좋았습니다. 이제는 취향이 6V6 앰프로 옮겨왔구요. 그 와중에 P12N 생각은 계속 나더라구요. 챔프, 전에 쓰던 P12N, 친구의 5C3 딜럭스의 조합이 준 자극이 저한테 54년산 5D3로 나타났습니다. 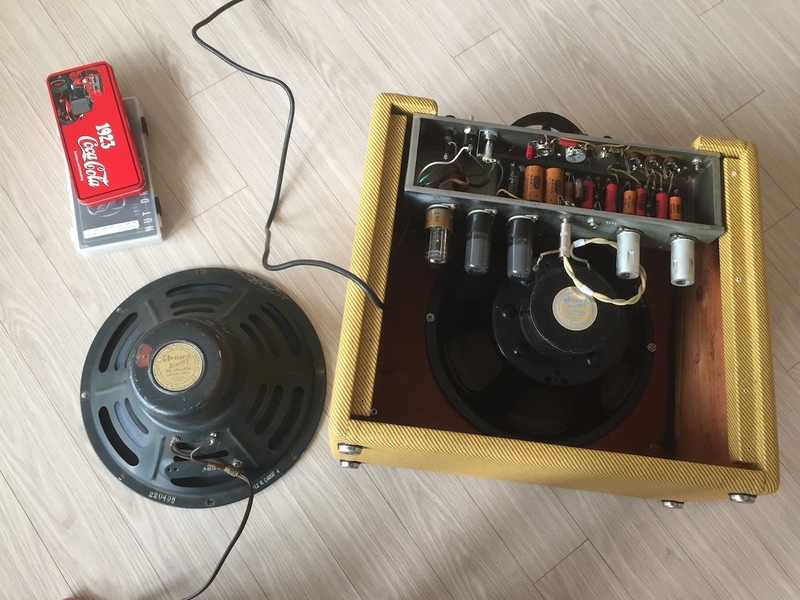 그 친구에게서 P12R 두개와 RCA 먹관을 받았고, 좋아하는 Amperex 12ax7 하나, 5y3 대체품 두개를 구했습니다. P12N은 흥정해서 65불을 줬는데 운송비하고 수리비까지 따져보니 15만원이 들어갔습니다. 6V6 두개 들어가는 딜럭스는 12와트, P12N은 18와트입니다. 챔프나 딜럭스는 4 정도의 작은 볼륨에서 주변 걱정 안하고 집에서 가지고 놀 수 있습니다. 예열 되고 나면 3에서도 아주 좋은 소리가 납니다. 챔프는 밤에, 딜럭스는 낮에 쓰는 사치도 부립니다. 친구 작업실에서는 볼륨을 키울 수 있으니 P12N 정말 좋습니다. 집에서는 볼륨을 꽤 높여야 제 소리가 나는 상황이 됩니다. P12R하고 P12Q 모두 재고가 있는대로 딜럭스에 달려 나왔었답니다. 대부분이 P12R이었구요. 친구한테 P12R이 세개 있는데, 두개는 NOS 상태로 하나는 벨이 있고, 하나는 없구요. 콘이 찢어진 5C3 순정 P12R은 리콘을 해서 제가 썼습니다. 소리는 벨 있고 없고 차이도 제법 납니다. 험버커 픽업 커버 있고 없는 성향 차이가 스피커도 있더라구요. P12Q는 딜럭스와 쓰면 P12N하고 비슷한 소리가 있습니다. P12R의 브레이크업은 관 달궈지면 금새 나오구요. 스피커 출력이 높아지면 예열이 충분하다는 기준도 조금 달라지네요. Bendix 5y3도 예열이 늦고, 딜럭스 앰프도 원래 그래서 그런지 둘이 잘 맞습니다. 더 오래된 규격이라 은은하고 선명한 5v4g는 입자감도 달라집니다. 스피커 세개 써보는 동안에 새로 넣은 관들은 다 길이 들었습니다. 정확히 어떤 현상이 있는건지 모르겠습니다. 나도 거기 같이 길드는 것도 있겠다 싶구요. 이번에 처음 진공관도 어떤 애들은 악기같구나 했습니다. 이제 납땜이 다 끝났습니다. It’s amazing that so many still have such old gear and taking care of it. In Europe you would definitely pay a buttload of money for such equipment. there are known and small companies making and selling reproduction (replica) in US, UK, and Germany. even they are not cheap. at least $800 up to $2,000. also, there are many kits you can build up. the price is vary depends on the output transformer sending signal to the speaker, and the speaker itself, a few components, and the finger joint cabinet. this company are making one of the best Tweed Deluxe amps. and it sounds better from the samples and youtube videos. It's amazing that so many still have such old gear and taking care of it. In Europe you would definitely pay a buttload of money for such equipment. Where do you always find this cool old stuff? Anyway, if you ever should start to build your own speaker then choose oak wood from old oak beams. I have some friends have 50’s and 60’s gears. they help me a lot. very clean or like new stuff are expensive of course. 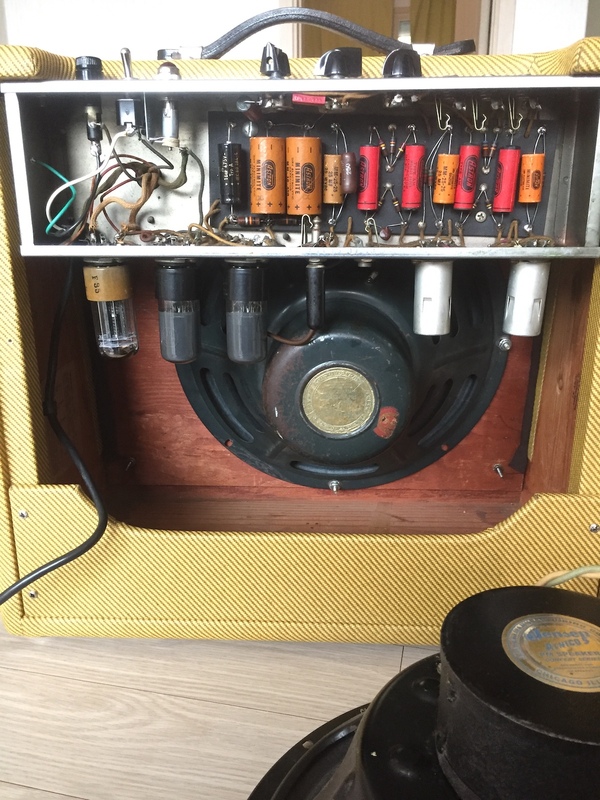 this 50’s Fender tweed deluxe are not cheap at all. but mine was cheap with modern speaker capacitors. it took like 6 months to find this one. then took another 4 months to get the right parts for this amp. I have some friends have 50's and 60's gears. they help me a lot. very clean or like new stuff are expensive of course. this 50's Fender tweed deluxe are not cheap at all. but mine was cheap with modern speaker capacitors. it took like 6 months to find this one. then took another 4 months to get the right parts for this amp. No category	. No reply yet	0 0 Want to undo ? 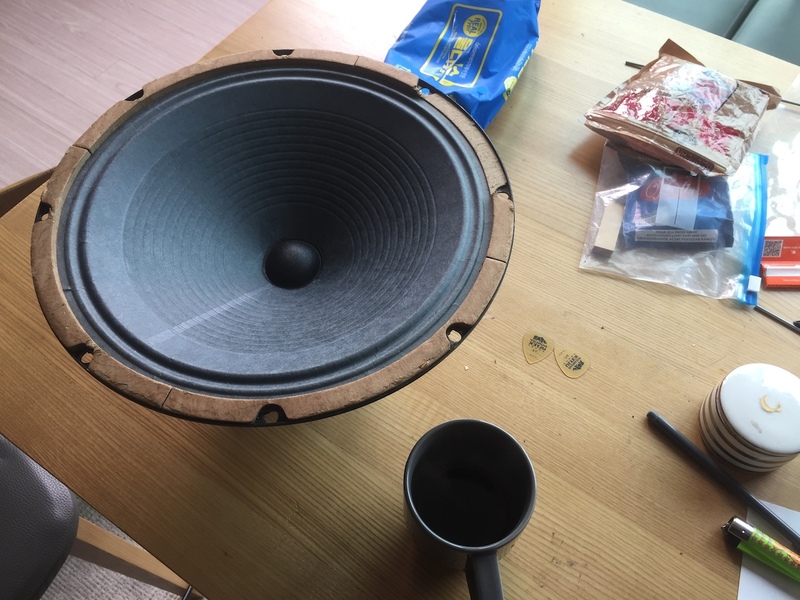 this wide panel tweed deluxe 5d3 came to me with weber 12a125a speaker a few months ago. it was a very good combo and the price was fair with the new skin. but, I couldn’t stand the blue color of 12a125a. everything else was good to me and my friends. 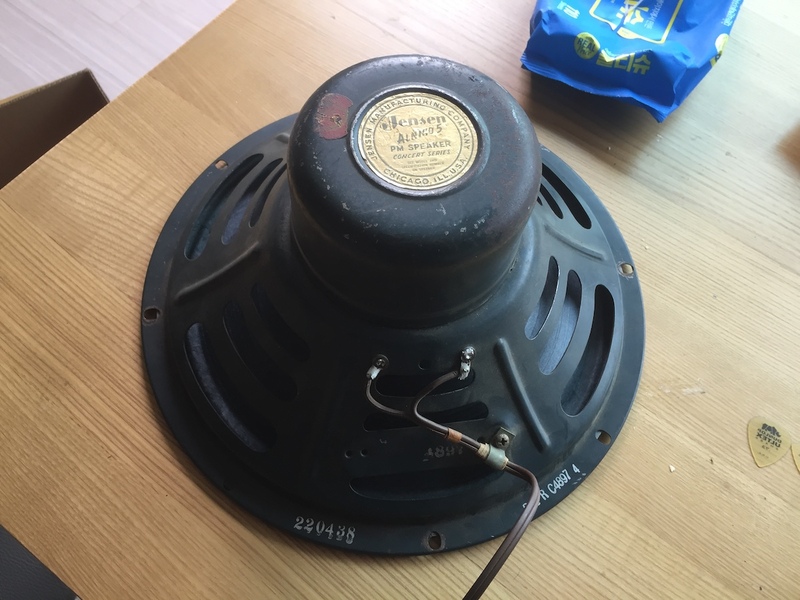 I’ve tried a like new ’51 p12r without bell, re-coned ’53 p12r came out ’54 5C3, black ’61 p12n, and this ’51 p12q. 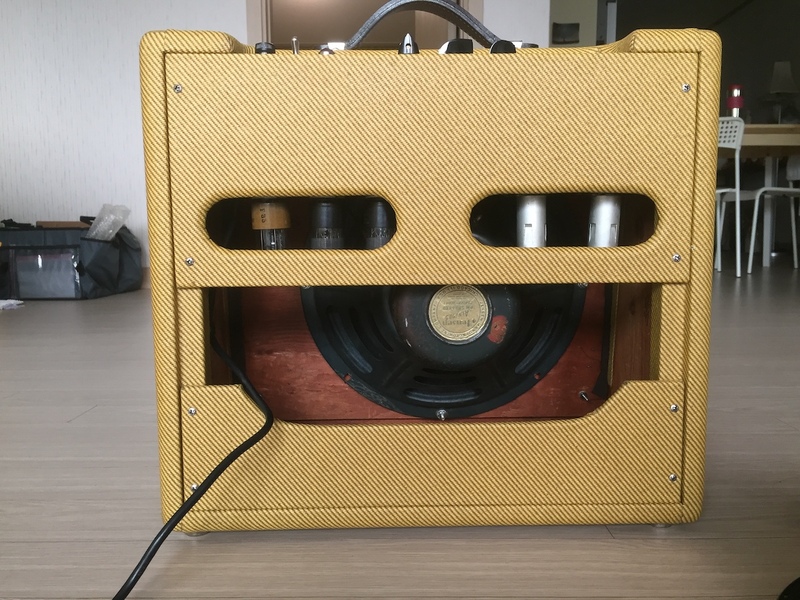 p12q is known as one of the original speakers for fender tweed deluxe. but didn’t have a chance to play with p12q before. p12q breaks up early like p12r. it was my first question while I was searching this speaker. and the question has solved. I was obsessed with vintage jensen speakers a while ago. especially with p12n. but it didn’t work well with 5d3 because of the breakup point. or the family and the neighbors. then p12q came into my mind. the sound was great like p12n even at the lower volume. and breaks up early enough like p12r in my imaginary world before I actually got this speaker. and it came true. I love this setup and won’t change the speaker again.